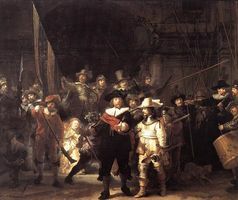 1 Caption: The Night Watch by Rembrandt, 1642. 2 Artists have painted and sculpted portraits since ancient times. Ancient Egyptian pharaohs had likenesses of themselves sculpted for their tombs. The Romans were masters of sculpting lifelike human figures and created statues of many famous leaders. During the Renaissance, painted portraits, such as the Mona Lisa, became popular. 3 From the 1600s through the 1800s in Europe, painters refined their skills and developed new styles of portrait painting. They discovered techniques that allowed them to produce portraits showing not only the physical likenesses of their subjects but also their personalities, emotions, and moods. 4 Sir Anthony van Dyck and Peter Paul Rubens of Belgium were two well-known portrait painters of the early 1600s. Painting portraits commissioned by wealthy citizens, they created flattering and idealized likenesses. Men were depicted on horseback; women were pictured in the finest gowns. Van Dyck and Rubens brought a sense of life and energy to their portraits using bright colors and the effect of shining light. Gianlorenzo Bernini was a famous portrait sculptor of the same period. His sculptures brought something new to portraiture when he pictured his subjects engaged in conversations and in other lifelike poses.